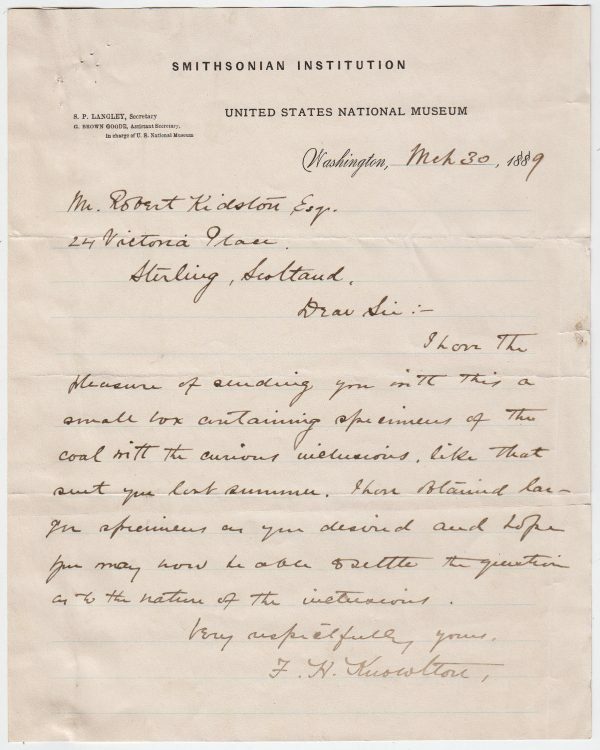 Autograph Letter Signed, to Robert Kidston in Stirling, Scotland, sending “a small box containing specimens of the coal with the curious inclusions, like that sent you last summer.” 1 page 10 x 8 inches, minor marginal tears, traces of mounting. Smithsonian Institution, Washington, 30 March 1889. Frank Hall Knowlton (1860-1926), plant collector. Robert Kidston, FRS (1852 -1924), Scottish palaeobotanist. In the 1880s Kidston was asked to catalogue the Palaeozoic plant collection of the British Museum (Natural History).